So today I’m going to share with you guys one of my writer secrets: the best book I’ve ever read aimed at a writer. No, what I’m talking about is a book that talks straight to your heart if you are a committed writer. If you’ve been around the block long enough to know there is no holy grail to find on the way to publishing success, other than hard work. This is NOT a book about the therapeutic process of art, a la Julia Cameron, either. Trust me, there’s less therapy and recipes for bestseller in this than any other random book out there. No. This book is simply the ONLY book that has reached me completely. Written as though its author had somehow crawled inside my head, saw all the silly insecurities, idiosyncrasies that crazy writer stuff that us artists carry within us but refuse to admit to anyone else. Not only has this woman seen that secret part of me, heard all my hopes, fears and random crying bouts, but she is speaking directly to it. 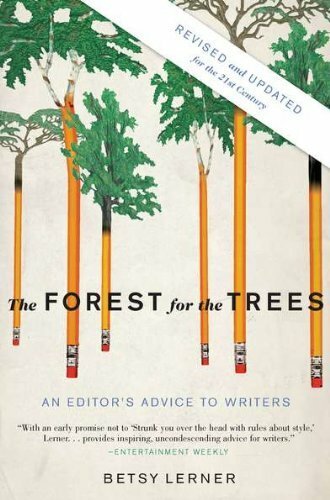 I’ve skimmed through plenty of books that profess to give advice to writers, from Stephen King to et al, and while they’re packed with useful tips, they’ve never reached me the way Forest For The Trees has. Penned by former editor at Houghton Mifflin, Ballantine, Simon & Schuster, and Doubleday and current literary agent Betsy Lerner, you’d do yourself a tremendous favour to read it. Lerner’s book runs the gamut from insider’s perspective (having purchased many new authors’ manuscripts in her editorial capacity), to presenting friendly and unabashedly honest advice as someone who has been around writers her entire life and has seen exactly how nutty and eccentric we can get. In other words, she really gets it. I don’t really know what else to say, except that I don’t unequivocally recommend books very often, but this one is worth its weight in gold. Not only have I found it comforting, but I’ve bought it for my writer friends.